Our kelp is hand harvested from a remote bay off the northwest coast of Iceland, in a manner that supports regeneration, and sustainability of the species. The plants grow deep in the tidal zone, away from the shipping lanes, where they are not exposed to the pollutants that may be present in other areas. Seaweed harvested from coastal regions near areas of heavy industry (such as the US and Japan), are prone to higher levels of contaminants such as heavy metals. This kelp is great and it is really healthy. Goes great with anything. 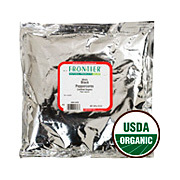 Kelp Granules Organic is shipped in a discrete, unmarked package. Orders are processed immediately and usually take about 3 to 5 working days to be received. We do ask that you try it for 2 to 3 weeks to feel the full effects. Any information received is used only for order processing and shipping purposes. Your information, such as e-mail address, will never be disclosed to a third party.